As an 8 year old boy I stood transfixed on the sand in Shaldon watching intently the old net fishermen rowing hard across the urgent incoming tide at the neck of the River Teign estuary in Devon in the South West of England. I can see even now the fisherman's focus as they strained to pull the purse close, nervous in the hope that as the net drew near to shore the water would explode with the silvery flanks of fresh run Salmon that would be sent up to London and would put food on the tables of their families that week. The anticipation was almost too much until that first fish exploded in the net and a yell would go up amongst the men and often me; their lives as much a part of that estuary as the fish that ran in it. So began my love of estuaries. Who was I to know that 12 years later in the very early '80s, I would be standing at the Murray Mouth 12,000kms away alone at 2am in the morning . My old Daihatsu parked atop a dune with the roar of the surf and a haunting wind my only companions and only forgotten by a sky full of diamonds. I had seen the locals; I had seen their weathered hard faces and heard their scorn at those that ran their headlights over the mouth at dusk. Whilst I feared them, I envied and respected them and their connection with this wildest of places. I too began to feel that connection as I visited the mouth alone to fish the night. 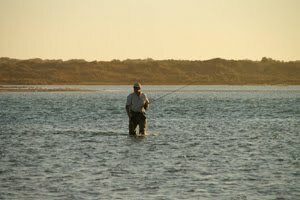 At dawn on a hot summer's morning I would paddle out into the surf to wash the bleariness from my eyes and stroke into the small glassy right handers that peeled along the channel out from the very mouth I had hunted mulloway in the night before. My only company the excited whistles of Oyster Catchers hurrying about in pairs on the pipi beds and that morning where a massive dull ghost cruised silently in an approaching banking wave, reminding me I had become part of this environment and now lived by its rules. An estuary is alive. Like a heart its tides pump in situ with the moon and the earth, bringing life along its path. I left Adelaide in the early 90s and went to the East Coast of Southern NSW. I worked in local government across sensitive environmental issues including the closure of hardwood logging as part of the South East Forest Agreement under the Carr government, I worked through the tragedy of the Thredbo landslide and its impact on tourism in the region and worked closely with communities both on the coast and mountains to learn what was important to a regional economy and even more importantly, a region's culture. In my 10 years I also saw what estuaries meant to the regional communities from Bateman's Bay down to Mallacouta, some of Australia's most beautiful coastline. On return to Adelaide my partner and I purchased a holiday house at Goolwa. Both of us whilst not of a scientific background have tertiary qualifications in areas of resource management and physical geography and Australian History, we also spend a lot of time on and around water. Since purchasing the house and returning to Goolwa at every opportunity it has been saddening to hear so many different views from "experts" to the point where I guard my opinion in public. As a dedicated fly fisher I have seen the downstream consequences of upstream mismanagement on countless streams and rivers across the country, be it on a smaller scale. However the causes and consequences are always the same. My first job out of University was writing 7 canoeing guides for the River Murray from the border(s) to the Murray Mouth. I kayaked every kilometre of backwater, anabranch and mainstream. I could see even then the disaster about to unfold. Sadly now we pay the price of greed and it is time to stop mucking around with something so much more powerful than we can ever be. It never ceases to amaze me that people forget that you simply cannot mess with nature. For anyone to think that the lower lakes are in a natural environment right now is simply sad. Concrete barriers, diverted water, extraction and on and on it goes. Meanwhile an estuary sits waiting only a block of concrete away that could return a community spirit and economy within 3 months. Ask any East Coast or Tasmanian estuary town tourism or small business committee whether they would like to have their estuary blocked and freshwater pumped in and see how they reply. We need to respect the ocean and the earth and in this hour of desperation give back some dignity to this grand old river. Returning the tide in the lower reaches would bring new life to not only her bottom reaches but the townspeople that live along her. Goolwa was never meant to be solely a freshwater port, it is not in her spirit. History clearly shows there were many drought years where the salt would push upstream and other years when the fresh would rip out to sea inviting the mulloway and Bream in to spawn. The arrogance to pretend we can alter what is only natural is testimony to the lack of common sense and political agendas that seem to prevail across so much of our lives. Nature can take only so much before she says I have had enough. Her warning could be no clearer than now and I certainly hope it is heard. I want to hear the Oyster Catchers' whistle on the wind, watch the Pelicans croaking and honking on their full bellys and look up to see the Cape Barren Geese flighting against the pink dusk sky. I don't want to see an artificial pool of tepid, distressed fresh water barren in life seen as a silver bullet to the quick fix whilst the surrounding environ collapses. I really encourage readers of this site to support the evidence based data and logic of everything it presents. It is a question of balance and to do that you need to work with nature not against it.